NZEI members are first up in mediation with the Government over the right to equal pay for work of equal value. Rebecca Matthews-Heron reports. Progress towards equal pay looks to be within grasp of some groups of women workers, and support workers employed by the Ministry of Education could be among the first to reap the fruits of many years of bargaining, legal action and political campaigning. Movement on the issue of the gender pay gap between men and women has been spearheaded by the case of caregiver Kristine Bartlett, and recently by a union campaign Treat her Right calling for the “sisters to be paid the same as the misters”. Male workers in New Zealand earn 12 percent more per hour, on average, than female workers. Mediation between NZEI Te Riu Roa and the Ministry of Education is the latest opportunity to progress the NZEI claim led by support workers Denise Tetzlaff, Kathleen Power and Mary Jones, on behalf of several hundred colleagues. More than six years ago an independent job evaluation report by the Pay Equity Commission showed that when compared with the male dominated job of corrections officers, support workers employed by the Ministry of Education were paid as much as $8 an hour less. The Government has agreed to use new pay equity principles, developed in partnership with unions and employers, for the first time in the NZEI pay claim. They intend to introduce legislation to enact those principles – that should make it easier for women to progress pay equity with their employers, rather than having to go through the courts. Among the support workers who would benefit from a move to equal pay, is Hutt Valley education support worker (ESW) Jacoline Brink, who has a unique perspective on the NZEI equal pay claim. Jacoline has an everyday insight into the male-dominated comparator used in the claim – her husband works as a corrections officer. The couple migrated from South Africa to make a new start with their young family, and Jacoline’s passion for education grew with her involvement in her own sons’ kindergarten. “I wanted to study early childhood education, but going into debt was not an option with a young family and hoping to own our own home,” says Jacoline. There was one problem, however – money. 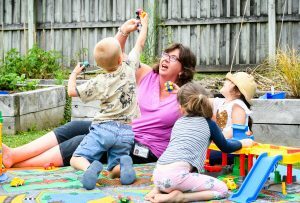 Despite doing skilled work with children with complex needs, and having to adapt to different teaching teams and cultures in kindergartens and ECE centres, the maximum hourly rate for support workers is $19.48 – less than the living wage of $20.20 per hour. Far from not having a “proper job” Jacoline says support workers are hard working professionals who bring life experience and empathy to the important work they do. She shares a story of an invite to the fifth birthday party of a child she worked with – one of her challenging first contacts. “The family introduced me, and everyone knew who I was and the contribution I had made to this boy’s life. Guests were greeting me – ‘Oh you’re the famous Jacoline’. I was laughing, but these families know the difference we make. I learned to speak up for their child as I would for my own sons. NZEI has also begun discussion with the Ministry of Education about utilising the principles to progress pay equity for school support staff, starting with the thousands of teacher aides who support learning throughout New Zealand.